Some night shift midwives sit in the office desperate to get home – they look worn out and you want to hug them saying “you will go home on time” but you know it’s a lie Other midwives are out of sight – they remain “with woman” in rooms praying that the handover will go smoothly with minimal interruptions. They want the transition from one midwife to another to be compassionate, woman centred, slow and not hurried . “Don’t forget the midwife on the birth centre – the woman she’s midwifing is in the pool and about to give birth any minute” says the maternity support worker as she leaves . “Has that Midwife had a break?” – “Not sure” comes the reply. Seats are hard to come by and woe betide the future midwife who gets a chair before a senior Midwife . Some staff arrive late and hide just behind the door pretending they’ve been there all along – but they did go home late last night . Not one manager in sight . The labour ward lead’s face demands silence – report starts 3 minutes late – you can taste the angst . The night staff are supposed to finish their shift approximately 15 minutes after the day shift start theirs . The night shift rarely leave on time and luckily someone has the foresight to recognise that the maternity support workers can go home as their reinforcements have arrived to take over – they like the new shift midwives and Drs smell of new freshly applied deodorant . Many perfumes and aftershaves mingle and brighten up the stale office air. The virtual RHS of the NHS in one tiny space. Now do the math -for one lead Midwife to hand over the cases and care of 8-16 women to the other in just 5 minutes (depending on the different labour wards in the nhs ) so that the day team can split and go to their allocated families, THEN have another more detailed handover (but VERY similar in principal to the one in the handover room) is nigh on impossible- in fact it is INCROYABLE. So many night staff leave late – some have many miles and hours to drive or travel in a post nights shift state of mind in order to reach the comfort of their own slumber stations. Some wisely choose to pay to sleep in hospital accommodation as they daren’t risk driving. Others travel as they don’t want to be away from home , they need to be up at 2.30pm to collect their children or their children’s children from school and then possibly cook dinner then prepare themselves for their third or fourth night shift . So what’s the solution ? I’m not sure there even is one. If you compare the way office workers start their day there is a great disparity happening between humans who work. It’s about time staff handover had a shake up – be punctual, be succinct , keep your opinions out of report , respect ALL. Allow each midwife to handover each women / family she/he is caring for with the back up of a written SBAR and encourage the lead midwife to take a step back . Someone somewhere must have an idea ?? It’s a handover state of mind . So that baby can understand you (and vice versa) – see what we mean ? your ears soon in Breastfeeding Week. This is a current drive in the NHS so I’ve decided it’s time for me to blog about it . We are often told as midwives that it’s not about working harder but working smarter . I’d like to try and find out if there is data collected about individual Trusts . The data would perhaps identify times when staffing was low , what the risks were to the women and the pattern of incident reports on those occasions . I also suggest that all maternity units have a duty of care to their staff to maintain accurate , exact records on how women are allocated to midwives, midwives individual workloads and time spent on NHS computers for work and personal use – this should be reviewed on a monthly basis and as part of FOI be available to the public . Do NHS Trusts that are using their own full time maternity staff to supplement staff absence and sickness assess the wellbeing of those staff? Is there a collaboration with occupational health , organisational development and Human Resources departments to review whether or not satisfactory and timely breaks were given. When this is quantified does it identify a distinct association with lack of breaks , working unpaid overtime , poor culture and is there a correlation with staff sickness and absence ? it’s time now to look at the bigger picture and collect data on these topics as well as birth statistics , outcomes , morbidly and mortality . Everyone who knows me knows that I promote , research and present about SkinToSkin contact . I know exactly why it matters to mothers , fathers and babies . Just recently I’ve noticed an advert for an upcoming ITV series “Delivering Babies ” in which Emma Willis stars as a auxiliary nurse assisting on a maternity unit – the profile photo shows a picture of Emma holding someone else’s baby without any of the parents in the photograph – this is what prompted me to write this blog . One particular bugbear I have is seeing a baby on a photograph with a health care professional without the mother or father being included in the picture . I have discussed this with many future and new parents and explained that they are the guardians of the newborn – protecting it from unnecessary exposure to anything . At most schools there is a social media policy which prevents the posting of children on social media sites . However the same rules don’t seem to apply for newborn babies. I see many programmes about pregnancy, labour , birth and the postnatal on TV which I choose to critique. Some I have given up watching through exasperation that the baby is not seem as a child of someone . Just google “Midwife” and numerous photos will pop up of midwives holding someone else’s baby . There’s even one from Call The Midwife – time to rethink why these photos exist and consider the human rights of the newborn ? Below are two collages I made following a google search – who are these babies and were the parents asked for full consent and counselled thoroughly about the fact that their babies would appear on internet searches ? -my desperate feeling was not new. -somehow they didn’t hear me -I felt soft , so ridiculous so weak. I felt anxiety would pass to my baby -I had no sense of worth . But it was as if my words couldn’t come out- I truly almost blew it . Jenny’s mutterings , midwives childcare and 12.5 hour shifts …. I have worked in the NHS for almost 40 years , so I was IN IT for ten years before I became a parent . When my daughter was 6 months old I returned to work as a Ward Sister on a medical ward in Oldham Hospital (now Penine Acute Trust) . Part of the reason for my return to work was to prove to myself that I could be a good mummy and a good nurse. I have always liked a challenge and do I regret my decision ? Yes and No is the answer . When I first thought about child care for my daughter there was no “on site” hospital nursery. Both my parents had died when I was younger. To go back to work meant I was driving 25 miles each way to start at 7.30am – was I mad ? Gaynor regularly took my daughter to the nursing home with her and she made the residents day – I also went to the home and felt like I’d grown a new family – his lucky we were . My son was born 5 years later and I was also lucky with his childcare – he went to Maureen who I met when I had to find childcare in a new area to start my midwifery in 1991 and she became Auntie Maureen to both my children . “Do 12 hour shifts have a negative impact on families NHS workers family love and home dynamics of NHS workers ? In fact if someone works a 12 hour shift they probably get up at 6am and get home around 10pm or later – that’s 16 hours of being up and active / put another day into that = 32 hours then three long days together = 48 hours – do you see where I’m coming from ? If a child does not see its own parent for three whole days does it have attachment implications ? Has anyone done any research on this ? IMO the 12 hour shift is seen as a money saving initiative for the NHS – 6 shifts covered in three days – bargain !! However a bargain ain’t a bargain unles you can prove it saves money. I hear both many sides to the arguments about 12 hour shifts but I also hear of staff who work 12 hour shifts “pacing” themselves , resting more on shift and I wondered if those working 8 hour shifts ever thought of “pacing” themselves at work ? More research and evidence is coming out about long shifts , that they can be a contributing factor in thyroid disease, cancer , heart disease , burn out and long term sick . Perhaps it’s time to analyse data on nursing and midwifery sick leave to see if the NHS sick leave has improved or worsened since 12 hour shifts became a “thing” . I have juggled child care most of my children’s lives and thank fully it’s been ok – even the time I caught one so called childminder pushing my daughter across a busy road by placing my three year old daughter across a pram!! I was actually a driver on that road (working as a community Midwifery student ) , so I went straight to her house and removed my daughter then & there . I rang my community manager in tears and she gave me two days of compassionate leave to help me arrange new childcare, this is how I stumbled onto Maureen – she embraced both my children into her family and like me she loved art and baking , so my children saw her home as an extension of mine . The 4 days that the long shift staff do not cover need to be covered – whereas when we all worked 8 hour shifts some staff would volunteer to stay late – this is impossible and dangerous on a long day . This blog is inspired by the women I have cared for as a Midwife and also the wonderful Spirituality and Childbirth book book by & Dr Susan Crowther and Dr Jenny Hall . The women I have met and cared for in my midwifery career have helped me to invent new ways of working for and with them.This experience has shown me that in order to achieve a special birth experience we must be connected with the woman . The value of approaching each woman with a different perspective but the same professional compassionate values regardless of their mode of birth is the core of individualised care . It’s taken me all my midwifery career to reach this point and I am still evolving. Making a sacred space for women and birth is something that we should all consider as midwives. How many times do we enter a room of birth to find the light shining brightly the window blinds up, the CTG machine on full volume and the sounds of the hospital permeating into the room ? Who has the right to enter the birth room ? Perhaps now is the time to talk about consent and to ask women whether they want people to come in and out of their room for non-essential reasons such as trying to find equipment or the medicine cupboard keys . Do your labour wards and your birth centre rooms have a curtain after the door to maintain the dignity and privacy of the woman and her partner and to keep the sacred space? Are the room, it’s people and contents treated as “our” (Midwives and obstetricians ) space or as the woman’s (family , partner , newborn) space. Do we GIVE the space to the woman she enters the room? Saying “this is your room , this is your space I am your guest” or is it seen that we take control of the area ? What exactly is the solution? . I think one of the answers is to start by questioning ourselves as to how we are behaving. There are guidelines to help us give evidence based care and evidence shows that dark quiet rooms , aromatherapy , touch and the continuous presence of a midwife are all beneficial for women in labour as they give birth . How do we transfer this to a birth in the operating theatre or an area where women with a higher chance of intervention are cared for ? Do we need a new guideline that encompasses making a sacred space ? I think so . We must celebrate that midwifery care is still an essential core aspect of birth in the U.K. and share our stories . To summarise the work of Dr Trish Greenhalgh – each person we care for shows us new evidence and this can be individual evidence – it doesn’t need to be large scale. Therefore if your compassionate care works then that’s your evidence . Use a drape in theatre to create a skin to skin tent where the new family can bond and take photos and don’t leave them to do your notes – do that later . Keep a check on the mums and baby’s condition regularly. Use massage to help increase the woman’s own oxytocin levels and darkness will also enhance the melatonin / oxytocin effect . Stay calm and talk quietly – try not to disrupt the woman’s hormones which are affected by noise . A sacred space means comfort , calm , love and kindness must be tangible within that area – it’s not about the space as much as the atmosphere- the way you help a woman to achieve this will have a long lasting positive effect not only on her self value but also impact you in your own practice in a wonderful way . Please think carefully wether you are a hormone disruptor or a hormone enabler . Be a true Midwife . A DM (Direct Message) on Twitter is a message you receive from someone that no one else can see – apart from the people included in the message. In the past four weeks I have received 7 DMs from a mixture of midwives , future midwives and women all with the same subject matter . This subject is mainly about ‘who decides when a woman is transferred from the room she gave birth in to the postnatal ward’ This seems to be a hot topic at the moment as the variation in time from birth to transfer is huge – especially when comparing Caesarean birth transfers to other birth transfers (and it might surprise you to know that the variation in birth to transfer time to the ward for women who have Caesarean birth is also vast – some units care for these women on the labour ward until their spinal has worn off , some units transfer to ward within a short time in recovery which leads me to question that support with breastfeeding must be patchy). Just the other week at Salford University Midwifery Society Conference ‘Transforming Birth’ click HERE for a summary of the day – I asked a question to the audience “are you, as future midwives pressured to move women to the postnatal ward (after they have birthed their babies) faster than the women themselves would like or you as a future autonomous practitioner would like ?” The result was that over 80% said YES. Do we as Midwives consider our own autonomy enough when we are working ? In order to give the woman a sense of feeling cared for and nurtured individualised, compassionate, holistic midwifery is paramount . Each woman is different- some may prefer a rapid transfer , others may not . Some women may need extra support to establish breastfeeding or be debriefed post birth or some women may want to rest in a quiet place with minimal noise before they are moved to the ward . If a birth takes place in a birth centre which doesn’t focus on time , women will stay in the same room post birth until their discharge home. Certain procedures have a standard time frame in which so many can be done – this is how operating theatre lists are generated and how the NHS deals with waiting lists . However birth is and must be a positive experience – even though it has coding costs and some births are planned to the day -we must give women more than they expect – stand up for them , be their advocates. Challenging the system is one of the ways we can make change happen – if we all accept each day “this is the way we do this” we cannot be developing our roles or our practice to improve woman centred care . I’m not saying it’s easy but I want you to imagine what care you would want for your sisters and your daughters ? Then give the women THIS care – I am in the NHS as I nursed my own mother until her death at home – I see the connection between care at birth and care at death . I have been a nurse to the dying and that experience has impacted on the care I give to women in a most human way . Whatever care you give , whether you transfer a woman in your fastest time or not is all rather irrelevant when you focus on the bigger picture – YOU are responsible for the care you provide , or you don’t provide -if you tell a student to do something that is YOUR responsibility and I suggest referring to this NMC publication which I look at each day The NMC CODE . If advice or suggestions are not kind , caring and have a direct clash with your duty of care , if a more senior Midwife tells you to do something this should be documented in the notes and be evidence based, kind and resonate with your trust guidelines plus the NMC code. Sometimes we are stretched short staffed , rushed and under pressure but at no point should this be the woman’s problem. Am I rushing her ? Do I feel under pressure ? Then if necessary give her some more time – and when you arrive on the ward give continuity of care to the woman and her newborn by transferring in SkinToSkin contact , admitting them both to the ward environment yourself , taking and recording observations , checking the woman’s pad and fundus ,getting the woman a drink and this will also help your colleagues on the ward immensely. As a child is born to a mother there are emotional , hormonal, physical and psychological needs that are satisfied when SkinToSkin contact occurs and these will give both short and long term health benefits to mother and child . A mother should be the first person to touch her newborn and that is one of the reasons that midwives should wear gloves. The mother’s skin will imprint the newborn with her smell, touch and love – the newborns face, smell and skin will imprint onto the mother and these are processes which are golden moments not to be missed . If a mother is feeling unwell or anaesthetised the midwife should hold the newborn next to the mother’s skin for her , taking photographs with the mother’s phone or camera will enable the first sight of the baby to be saved and also surpass consent issues around photographs- the parents can then choose what they show to others and what they keep . A Midwife is the woman’s and the newborn’s advocate and it’s crucial that the Midwife finds a way to involve the second parent in skin to skin contact somehow after the mother has held her newborn for a sufficient time to enable the first breastfeed . If a woman wants to breastfeed once this has the benefit of giving colostrum as a gut protector and immuniser- colostrum contains immunoglobulin. In cases of premature birth courage , knowledge, dexterity and skill are needed to enable skin to skin to take place . 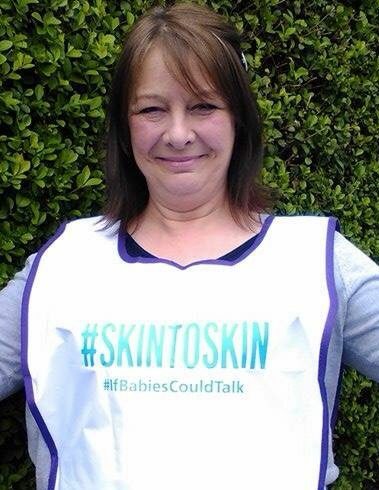 The value of collaboration (as discussed by @CharleneSTMW at a recent MatExp event at Warwick Hospitals cannot be understated – all members of the team must be aware of the benefits of SkinToSkin contact at Caesarean or instrumental birth . We must all sing from the same sheet and share the same values so that everyone agrees that skin to skin with mother takes place before any other intervention . Skin to skin is not an intervention it is something as natural as putting your key into your front door without thinking about it . However it seems that women and newborns are in a postcode lottery – where you live and which hospital you attend for your birth can determine and influence your chance of skin to skin . I receive many requests from midwives from the NHS and across the world asking me to help them overcome barriers to facilitating skin to skin contact within their workplaces especially in the operating theatre . Some are stopped by anaesthetists, obstetricians , some ridiculed as strange by their colleagues and told “it’s not happening here” . We must remember that nothing is final and show the evidence which is growing by the day that skin to skin contact is not something that can be measured , it’s a primitive response which comes as second nature to a new mother – if that mother is out of her comfort zone she won’t have the strength or courage to question why – that’s OUR JOB ! On 22.9.1978 at around 6pm my dear mum died. I was 18 years old and it felt so unreal when it happened . I always imagined she’d come back to me . I still dream about her vividly and feel her presence close to me each day . My mum was an ordinary mum , she had no airs and graces , I never heard her talk badly of anyone, she was an extremely kind soul who saw the good in everyone . My mum was always making people laugh , she was also a fabulous baker, never learnt to drive and had a great relationship with her sister Hilda who used to take her away on sisterly weekends once in a while – my dear Auntie Hilda outlived my mum by over 26 years and she shared many memories of their childhood with me over those years – and I treasure these stories . I don’t ever really remember my mum shouting at me or my sisters, she taught me how to be a good person and gave me an insight into why being a good mother is so fundamental to a child’s life and how a mothers love can shape the person that we become . Every year on on the 22nd February (my mums birthday ) and the 22nd September I celebrate her life by buying flowers and writing about her in one of my journals . My mum gave me a good life , because we lived in a shop she was always there every morning , every afternoon when I got home from school – I didn’t realise how lucky I was until just recently . One thing my mum used to say to me was “if you really believe in something try to stand up for it and don’t let it it go” I see now that believing in skin to skin is not something I am ever going to let go of .